Santa Monica Beach is across the street from Ocean View Hotel; the Santa Monica Pier and Third Street Promenade are each one block away. If you're looking for a great (and cheap!) hotel in Santa Monica, CheapTickets is the best place to find them. We offer deals on the best 1033 hotels throughout Santa Monica. No matter what you're looking for, we have options for you. Grab great rates on the 323 affordable 3-star hotels that are easy on the wallet without sacrificing comfort. Looking for more luxury? Try one of the 124, 4-star hotel accommodations in Santa Monica. No matter your budget needs, we've pulled out all the stops to make sure you have plenty of vacation options. Maybe you prefer to search for your hotel deals based on what each hotel offers? For example, let's say you just want to find a hotel or resort that has a pool to cool off in after a long day exploring Santa Monica. 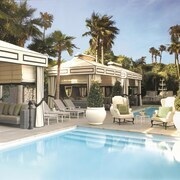 Scroll down to choose from the 402 hotels in Santa Monica that has a pool for guests. Or search for deals on Santa Monica hotels offering free wifi or breakfast, non-smoking rooms, and more! CheapTickets is here to be your personal travel agent for your next trip to Santa Monica. Get booking today! What hotels in Santa Monica offer free wifi access? Are there deals on Santa Monica hotels offering free breakfast? Yes! The only thing better than finding a great deal on a cheap hotel in Santa Monica is finding one that offers free breakfast. Grab some eggs, a waffle, or some healthy oatmeal before a day full of exploring Santa Monica and all that it has to offer. Below are just some of the many hotels that offer free breakfast in Santa Monica. Loews Hollywood Hotel is a 4.00 star rated hotel property in Santa Monica that offers free breakfast. 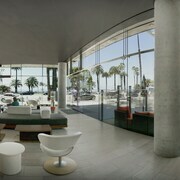 Custom Hotel Los Angeles Airport is a 3.50 star rated hotel property in Santa Monica that offers free breakfast. Sheraton Gateway Los Angeles Hotel is a 4.00 star rated hotel property in Santa Monica that offers free breakfast. La Quinta Inn & Suites LAX is a 3.00 star rated hotel property in Santa Monica that offers free breakfast. What about deals on pet-friendly hotels in Santa Monica? Santa Monica is a great place to get outside and explore with your pets in tow so don't leave your furry friends behind. Below you'll find great deals on hotels in Santa Monica that allow pets. Don't forget to bring plenty of treats! Jamaica Bay Inn is a popular, pet-friendly, 3.50 star hotel in Santa Monica. The Westin Los Angeles Airport is a popular, pet-friendly, 4.00 star hotel in Santa Monica. 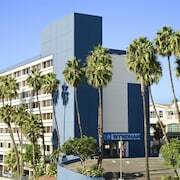 Holiday Inn Los Angeles - LAX Airport is a popular, pet-friendly, 3.00 star hotel in Santa Monica. Hilton Los Angeles Airport is a popular, pet-friendly, 4.00 star hotel in Santa Monica. Any good rates on Santa Monica hotels with restaurants? Absolutely. Don't want to deal with planning our all your meals on your trip to Santa Monica? We don't blame you. Keep the hangry away by staying in one of the 203 hotels that have restaurants. With a room at one of these spots, all it takes to get a good meal is hopping in the elevator. Check out some of the most popular hotels in Santa Monica that have restaurants below. Book Kimpton Hotel Palomar Los Angeles Beverly HillsKimpton Hotel Palomar Los Angeles Beverly Hills is a 4.00 star hotel and has one or more restaurant options. 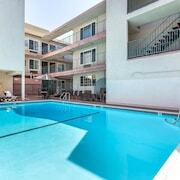 Book La Quinta Inn & Suites LAXLa Quinta Inn & Suites LAX is a 3.00 star hotel and has one or more restaurant options. Book Hilton Los Angeles/Universal CityHilton Los Angeles/Universal City is a 4.00 star hotel and has one or more restaurant options. Book Custom Hotel Los Angeles AirportCustom Hotel Los Angeles Airport is a 3.50 star hotel and has one or more restaurant options. What are the cheapest hotels in Santa Monica with pools? What's better after a long day exploring Santa Monica then a relaxing dip in a pool? Finding the Santa Monica hotel you need for a bargain! Cool off and unwind at one of our 402 Santa Monica hotels with a pool. Browse some of the top deals on these hotels and resorts with pools in Santa Monica below, but be warned: You may not want to check out! Extended Stay America Los Angeles - Burbank Airport has a pool and a 2.50 star rating. The Hollywood Roosevelt has a pool and a 4.00 star rating. Sheraton Gateway Los Angeles Hotel has a pool and a 4.00 star rating. What hotels in Santa Monica offer parking for guests? Once you've made your way to Santa Monica, the last thing you want to deal with is finding parking close to your hotel. Avoid the hassle of parking around the block and carrying your luggage all the way to the lobby by booking one of our hotels with parking. Check out deals on some of the 490 hotels in Santa Monica that offer parking for guests. Valley Inn This hotel has a 2.00-star rating. Extended Stay America Los Angeles - Northridge This hotel has a 2.50-star rating. Sofitel LA at Beverly Hills This hotel has a 4.50-star rating. Do Santa Monica hotels offer 24-hour concierge services? When you're on vacation, things don't always go according to plan. Travel with peace of mind when you book one of our 202 hotels in Santa Monica with 24-hour concierge service. That way you know help is always phone call or elevator ride away. Try Hotel Hermosa. It's a 3.00 star rated hotel in Santa Monica that offers concierge services 24 hours a day. Try Hyatt Regency Los Angeles International Airport. It's a 4.00 star rated hotel in Santa Monica that offers concierge services 24 hours a day. Try Portofino Hotel & Marina - A Noble House Hotel. It's a 4.00 star rated hotel in Santa Monica that offers concierge services 24 hours a day. Try Aventura Hotel. 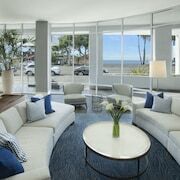 It's a 3.50 star rated hotel in Santa Monica that offers concierge services 24 hours a day. What about low rates on non-smoking hotels in Santa Monica? Custom Hotel Los Angeles Airport This hotel has a 3.50-star rating. LA Crystal Hotel This hotel has a 3.00-star rating. What are the cheapest Santa Monica 3-star hotel deals? Our 3-star hotels bring you quality accommodations at a lower price point for the perfect, budget-friendly vacation in Santa Monica. With 323 3-star hotels throughout Santa Monica to choose from, you still have options. Browse our selection below. What are the best deals on 4-Star Hotels in Santa Monica? Santa Monica is full of hotels and it can be hard to narrow down where you really want to stay. Luckily, we've done that hard work for you be narrowing you from 1033 hotels throughout Santa Monica, to the 124 4-star hotels in Santa Monica. Our 4-star hotels in Santa Monica are exactly what you need for your next family trip, romantic weekend, or solo getaway. Check out our most popular deals below. What are the most popular attractions in Santa Monica? People travel to Santa Monica from all around to witness the incredible sights and attractions. With 18 sights to see during your stay, you're sure to have a busy trip in Santa Monica. Below, we've listed some of our favorites. Short walk to the beach. Santa monica pier was within a 20 minute walk. Loved having the two bedroom suite. Very clean for the most part; one little stain on the carpet, but otherwise all was good. Updated sheets and bedspread-- towels smelled fresh and not like other standard hotel towels! Was here over the weekend for a quick getaway. The service of this hotel is the absolute best. We were first welcomed w/ the FREE valet. Which is a complimentary service offered to all guest. The valet guys were extremely kind and immediately started suggesting places for us to hang out and eat. Whenever we left and came back, we were always greeted with “welcome back” or “have a good time out!”. Next, at check in we were greeted by extremely pleasant front desk staff that extended our check out time and upgraded our room for free. We was also given champagne. Which was given daily to all guest for FREE at the front desk. The hotel is modern and beautiful. The amenities such as yoga, free cappuccino or latte, and the heated swimming pool were amazing. The furniture and decor in the rooms are nice and modern. Our view of the ocean from our patio was so beautiful. 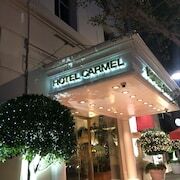 We really enjoyed our stay and would definitely choose this hotel again if come to the LA area! Very nice hotel, very clean, great restaurant. My only complaint is the additional fees. You pay a premium for EVERYTHING you purchase + a daily $25 hotel surcharge, in addition to $46/night to park your car there. I probably will not return for this reason.